Photos by Tim Savage, no reproduction without permission. The photos show Mick Murphy, floor manager, director and self shooter, on location wearing a very silly hat! 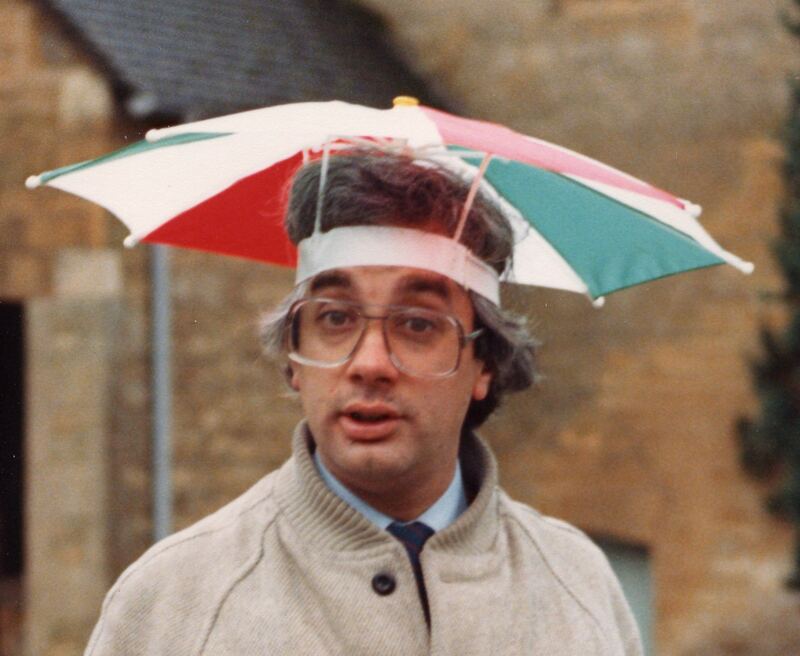 Apparently it was a very practical piece of headgear meaning that Mick could do countdowns with both hands, whilst still keeping dry! The outside broadcast was a Pebble Mill at One in the Cotswolds Special and this location was a brewery – possibly the Donnington Brewery near Stow-on-the-Wold. Mick was standing in for Barbara Courtney-King when these shots were taken. The dark haired girl with Mick is researcher, Jacqui Phillips. Thanks to Tim and Jayne Savage, Jane Clement, Dave Bushell and Mick Murphy for providing additional information. That bought back some memories ! !